Bendapalooza Day 3! It’s a Batman ’66 extravaganza: Batgirl! Riddler! The Batmobile! All from NJ Croce. My first Batmobile was a Corgi. 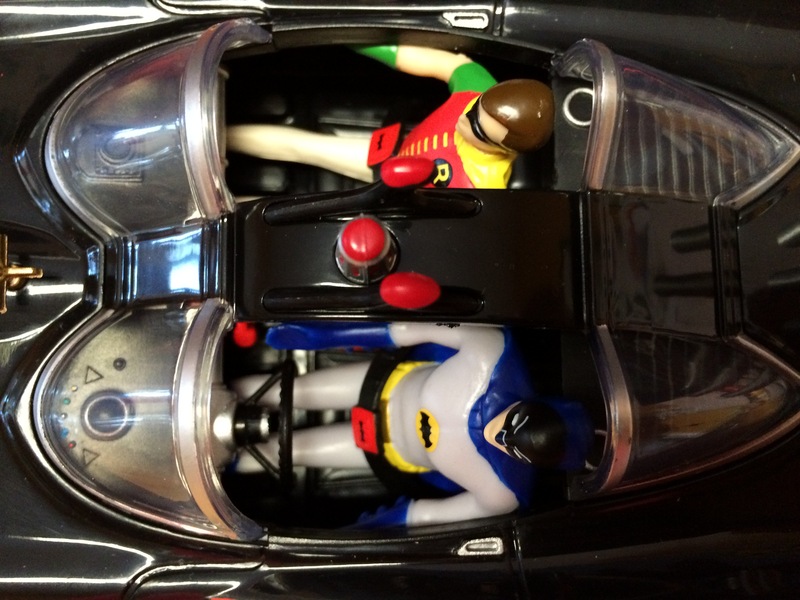 You know the one: the black die-cast metal job with removable Batman and Robin. 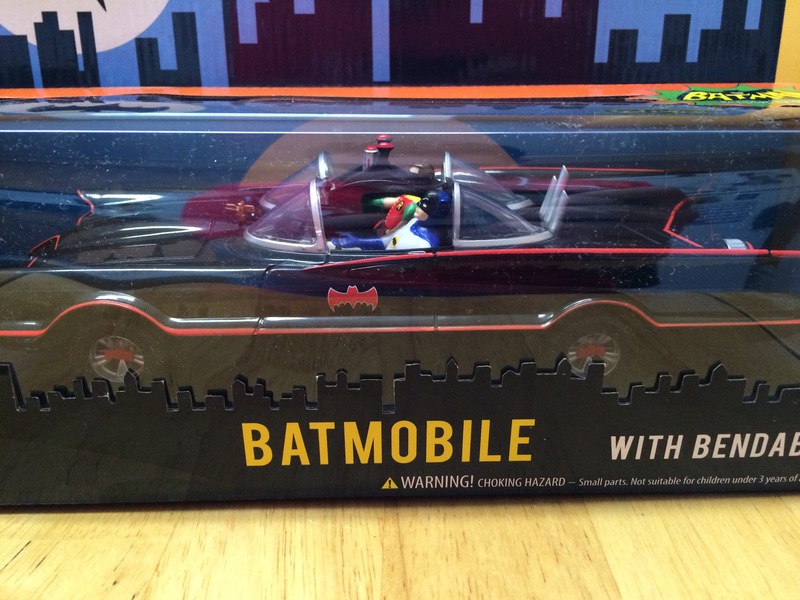 Came with a Batboat (and trailer). 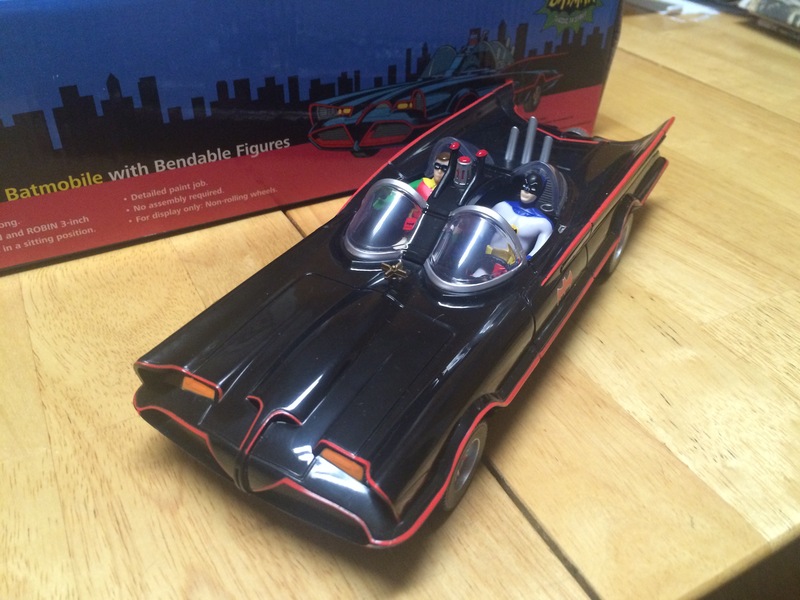 This is just a way of saying my days with ’66 Batmobile toys goes all the way back to early childhood. There have been many, many versions produced since and most are great in their own special way. Now here comes NJ Croce, with their version, a 1:24 scale, 9 1/4-inch job. And let me tell you: This is one of my favorites and one of the most charming you’ll ever find. Let’s start with the detail: This is a smartly sculpted replica of George Barris‘ baby. 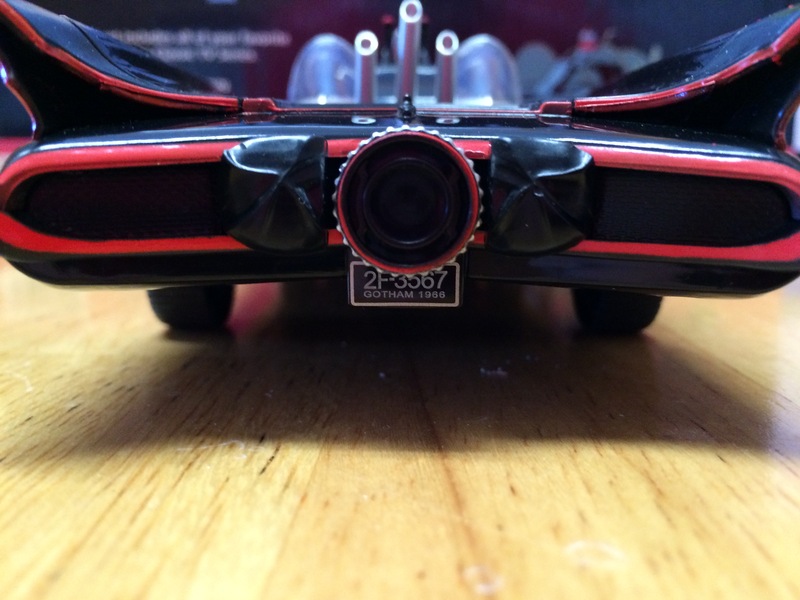 From front to rear, it’s a sleek, accurate depiction of Batman‘s famed roadster. The windscreens are clear, there’s the mobile Batphone — there’s even the fire extinguisher adorned with the Bat-symbol. That’s the kind of attention to the small stuff that I really appreciate. Just hanging out at the drive-in, waiting for their Batburgers. One thing to note: The wheels don’t move, by design. 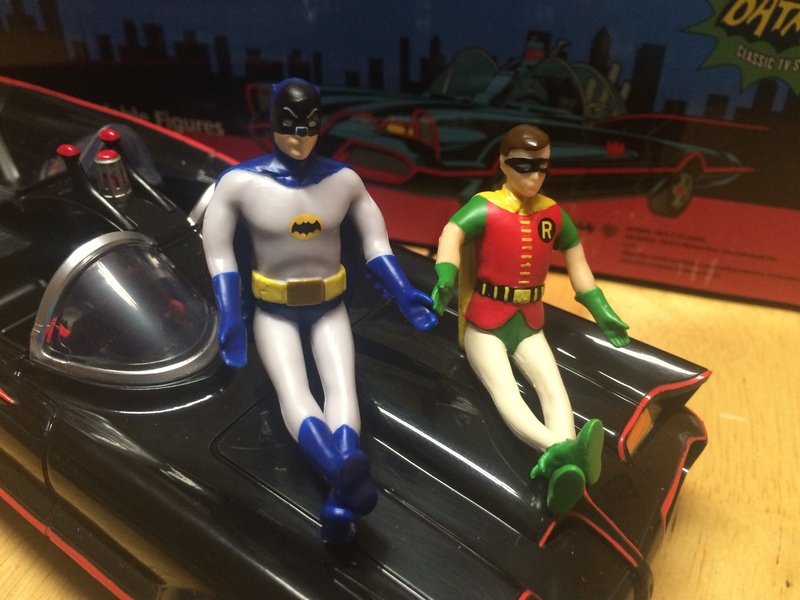 Licensing agreements — especially where Batman ’66 is concerned — are an exercise in threading needles. If one company, in just one example, makes Batmobiles where the wheels move, another might not be allowed to. But it doesn’t matter. This is a Batmobile that’s not only a fitting tribute to the show and its legacy — it’s a cool item for any shelf or desk. The Batmobile will run you about $35 and, if all goes well, be out within the next few weeks. 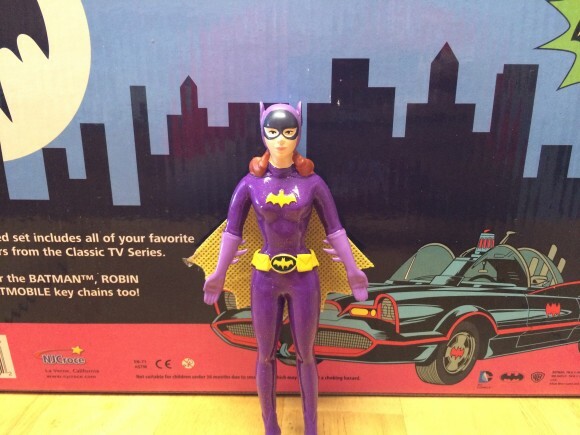 Slowly, slowly Yvonne Craig Batgirl items are making their way out. She was the last of the main, living actors to sign a likeness deal and since the announcement very little has made it to market. Mattel‘s 6-inch action figure is due out in the fall and Diamond‘s statue and bust are a little ways away. After that there’s Tweeterhead‘s maquette. There’s a plush from Bleacher Creatures, but that’s about it. So you Batgirl fans are in for a treat because the first real Craig figure will be out in a matter of weeks. Best part of this bendable is her show-accurate, spangly purple outfit and two-tone cape. For whatever reason, action-figure manufacturers have an easier time replicating actors’ faces than actresses’. At least it seems that way to me. 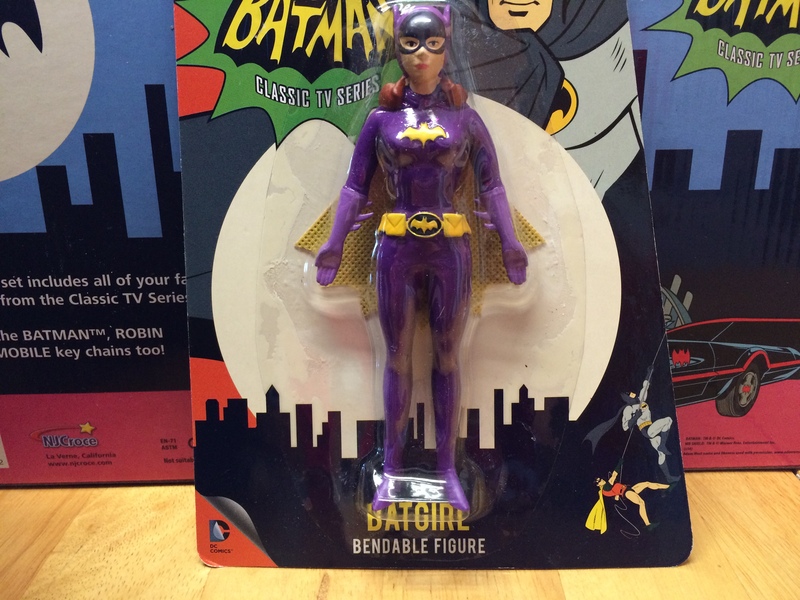 In the case of a bendable, it’s doubly difficult to nail a likeness but NJ Croce gives it their best with Batgirl and no collection is complete without her. Batgirl, whose baby are you? Mine, all mine. And she can be yours for about $8. The last of the Big Four villains produced by NJ Croce, this is one of my favorite Frank Gorshin Riddler figures so far — and it’s all about the mask. Gorshin didn’t really wear the mask that often — mostly during capers when he wasn’t wearing his derby and suit. The rest of the time, it was around his neck, giving the actor’s face more time before the camera. I LOVE that NJ Croce opted to go this way. 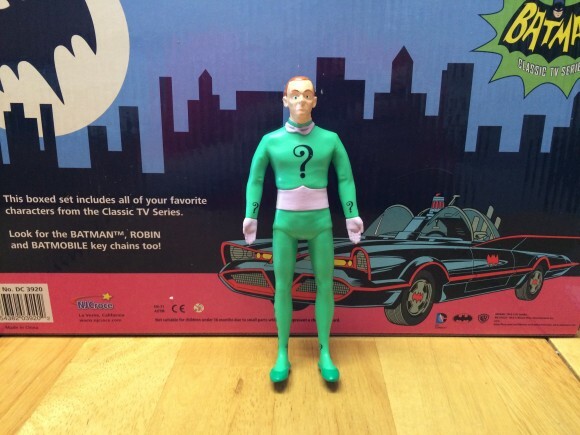 It just makes this figure a little special and helps it stand out from other Riddler figures out there. Like Batgirl, he’ll be about $8 and available pretty soon. So, now we have the seven most important characters from the show. Would I like to see the Mad Hatter and Mr. Freeze? King Tut? Sure I would. But they would all be Batgravy. Because I am already doubtlessly, bendably content. It would be nice if they can updated the Corggi verson. The Corggi version ,had the perfect size (scale). Tihis time,with better details,including Batman&Robin..